Welcome to Vandals Uncorked! U of I’s first-ever wine club features excellent-value wines produced by wineries with a Vandal connection. Join now to have award-winning varietals from regional wineries delivered to your door by Vandals Uncorked. Do you know of a winery or vineyard with a University of Idaho connection? Tell us all about it, here. Business partners Rick Wasem and Lynn DeVleming founded Basalt Cellars in 2003 with a shared passion for creating rock-solid, age-worthy wines. Their success was immediate with their 2004 Merlot winning “Double Gold” and “Best of Class” at the Tri-Cities Wine Festival. Combined with their wine-loving staff, Holly (Jacobson) Bonnalie ‘06 and Leisha Evangelho, Basalt Cellars has one mission: produce awarded and respected wines from the finest vineyards in Washington State, as well as local vineyards located in the Lewis Clark Valley AVA. University of Idaho holds near and dear for Basalt staff member Holly. She was involved in the Kappa Alpha Theta sorority for four years and married fellow Vandal and Sigma Chi fraternity member Geno Bonnalie’07, who proudly played beloved Vandal mascot “Joe” for a year. A fateful phone call from Basalt Cellars owner, and winemaker Wasem brought her to Clarkston where she is able to utilize her microbiology degree. Her passion for wine and science has provided the perfect “blend” (pun intended) for her career in the wine industry over the last 11 years. Enjoy refreshing aromas of passion fruit, white peach and soft mineral notes. Our Rim rock blends have consistently won high praise from professional wine judges and wine-lovers alike throughout the country. You can’t go wrong with this delightful blend. Education paved the way for success at Clearwater Canyon Cellars. Karl Umiker ‘00 earned a bachelor’s degree in chemistry (University of Arkansas) and a master’s in soils (University of Idaho) focusing on soil chemistry, later serving as a research support scientist at U of I for more than 10 years. Coco Umiker ’04 earned bachelor’s degrees in microbiology, molecular biology and biochemistry (University of Idaho), and a Ph.D. in food science (Washington State University) in the enology and viticulture program. Her doctoral research focused on wine microbiology. Their education has empowered them to explore the many facets of grape growing and wine making in the Pacific Northwest. In 2003 the Umikers began planting vines on their family’s Idaho Century Farm, nestled in the Lewis-Clark Valley of Idaho and Washington. A year later they pooled their resources with three other couples to establish Clearwater Canyon Cellars, the 15th winery in the state at the time. The operation is now solely owned and operated by the Umikers and is well established in a state-of-the-art facility surrounded by their Umiker Estate Vineyard. They are the fourth generation of their family to live and farm there. Pecan pie, pomegranate, currants, juniper berries, roasted marshmallows and cobble stones lead you into the glass and seemly soak into your palate. Velvety tannins and intense color make this an age worth wine that can be enjoyed for its boldness now or can be your muse for years to come. Two regular shipments per year (November/December and May/June) of specially selected, high-quality wines. Each shipment includes four bottles of premium wine proudly created by members of the Vandal family. Winemaker profiles and tasting notes with each shipment. Vandals Uncorked offers outstanding wines for less than you can buy them at the winery. Each shipment of four wines will cost $100 to $130, plus tax, shipping and handling. Membership is open to everyone (21 and over) and makes a great gift for Vandal moms, dads, grads and friends. Join now! Established in 1981, family-run Bitner Vineyards is in the rich, beautiful area of the Snake River Valley in Caldwell, Idaho. Owners Ron and Mary Bitner have been dedicated from the start to helping build up the wine-growing community in Idaho and are proud to be a part of the new frontier of Idaho wine. The Bitners’ Vandal roots run deep. Ron worked for University of Idaho Extension 1976 -1980 and was Idaho’s first integrated pest management specialist. He has been on numerous agriculture boards with University of Idaho over the years and continues to work closely with University of Idaho Food Technology center in Caldwell. Continuing the Vandal tradition, daughter Amy Bitner attended U of I from 1994 to 1996. During her time at U of I, she worked at its Extension center in Parma as a bug scout, conducting research on sustainable farming in alfalfa seed. University of Idaho holds near and dear for Basalt staff member Holly. She was involved in the Kappa Alpha Theta sorority for four years and married fellow Vandal and Sigma Chi fraternity member Geno Bonnalie’07, who proudly played beloved Vandal mascot “Joe” for a year. A fateful phone call from Basalt Cellars owner Wasem brought her to Clarkston where she applies her microbiology degree. 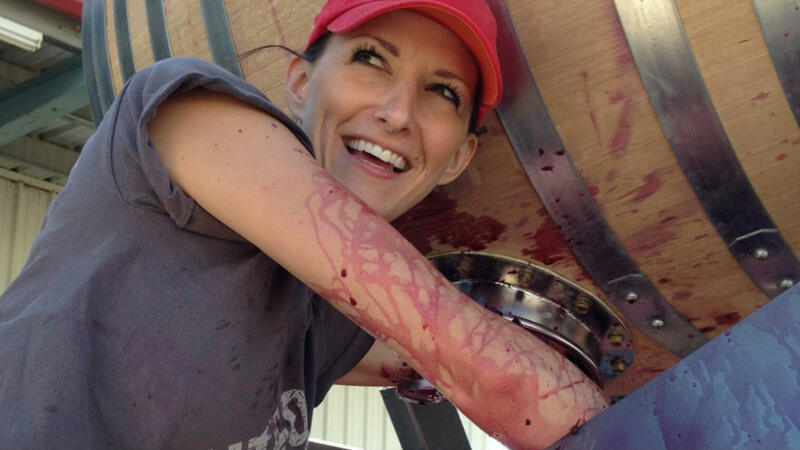 Her passion for wine and science has provided the perfect “blend” (pun intended) for her career in the wine industry over the last 10 years. Family-owned and operated Indian Creek Winery embodies that old saying “Work hard, play hard.” Bill ’61 and Mui Stowe started the winery 1982 to craft premium wines from the best grapes in the heart of Idaho’s Snake River Valley appellation. Their 18-acre Estate Stowe Vineyard is one of the oldest vineyards in Idaho. Bill was a proud University of Idaho Vandal who earned the Idaho Wine Commission’s Lifetime Achievement Award. 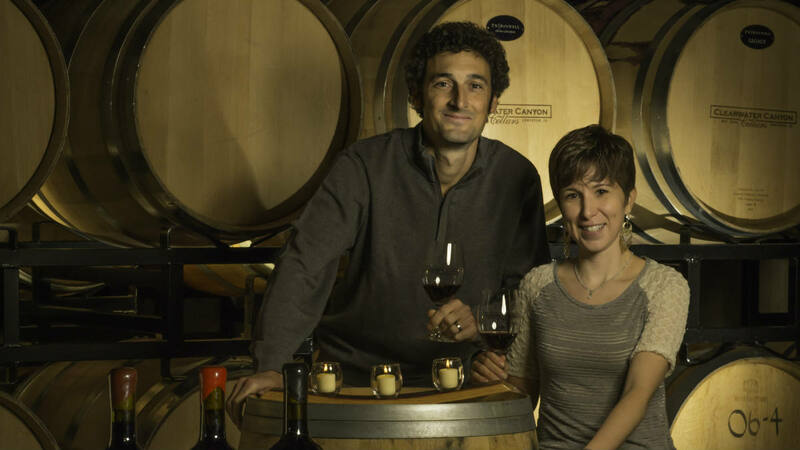 In 2005, the Muis’ daughter Tammy Stowe-McClure ‘06 and husband Mike McClure ’05 came on board as the second generation of winemakers and continue the success of this growing winery. Tammy applies her degree in Fine Arts to design the winery labels. While at U of I, Tammy was on the track and field team and used her finely honed track skills to compete on American Ninja Warrior (seasons 7-9) as the “Wine Warrior.” Mike was a distinguished student at U of I and received a bachelor’s degree in geology. He's passionate about creating beautiful and balanced wines and believes it all starts in the vineyard. His work has garnered several gold medals and recognition from wine industry publications. Founded in 2007 by viticulturist and winemaker brothers Art & Doug ‘81 McIntosh, Lindsay Creek is truly a Vandal family vineyard. The McIntoshes represent three generation of Vandal alumni: the brothers’ mom is a Vandal, along with Doug, his wife Brenda ‘07 and both sons, and Art’s daughters are all U of I graduates. Many aunts, uncles, in-laws and cousins are Vandals, including cousin Chris McIntosh ‘78, who heads up U of I’s Agricultural Economics & Rural Sociology Department. Lindsay Creek Vineyards started its vineyard with only 150 grapes. Currently they own and operate over 11 acres of vines. The transition from wheat to growing quality wine grapes has been fast-paced, educational and extremely rewarding. Both Art and Doug have nearly twenty years combined experience in viticulture and enology and each have been certified by WSU. Through first-hand experience, consulting with regional experts and a passion in producing premium wines, Lindsay Creek Vineyards was created. Crossings is one of Idaho’s oldest locally owned, family-owned wineries, and was named the 2017 Idaho Winery of the Year by Wine Press Northwest magazine. Owner and general manager Doug Jones ‘88 is a second-generation vintner with deep Vandal roots. Jones served as editor of the Argonaut student newspaper and a senator in the Associated Students University of Idaho as an undergraduate. His parents, brother, sister and wife Elizabeth ‘92 are all Vandals, and his son Dashiell is currently a student. Located in scenic Glenns Ferry, Idaho, Crossings has grown to be a one-stop winery and culinary destination, offering award-wining wine, upscale dining, golf, public and private events, and over-night accommodations.